Parker is your average girl. She goes to high school, she goes out with boys, she loves sports. Softball to be exact. But when her life is turned upside down, she turns herself upside down. She quits softball, drops weight, and becomes a little friendly with the boys. Then, a new baseball coach steps into her life, and she’s more than happy to add him to her kissing list. She thinks this is what she wants, but is it really? I read Catching Jordan a while back and fell in love with Miranda’s writing. You know I’m not big on contemporary at the moment, so I’m super picky about the stories I read. At the beginning of the book, I wasn’t sure how I’d feel about this one, but it took me by surprise. Stealing Parker was a definite win for me. I loved Parker as a character. She was real and personal from the very beginning. She could’ve been any girl from my high school or even college. I love when a character makes you sit up and pay attention and Parker was that for me. Sure, there were parts where I kind of wanted to strangle her a little, but that just makes her more human. While I loved Parker, I was insta-love-beyond-all-love with Will! Seriously, the moment he stepped into the pages, I was a gonner. This boy was a gorgeous, smart, caring specimen of amazingness. His relationship with Parker and those around him was great. I got a feel for his character right off the bat, and I couldn’t help but cheer him on in everything throughout the book. Overall, I loved this book. The chemistry between the characters Miranda created was outstanding. The tension, the longing, the perfectly placed little phrases, all of that made the book just that much more. This high school is one I wish I could’ve gone to, just so I could meet all these fabulous people. I can’t wait to see what Miranda has for us next! 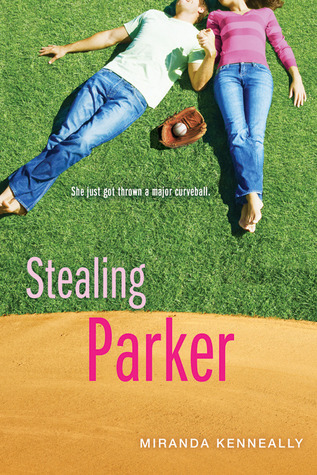 Stealing Parker comes out October 1, 2012! Get it, read it, love it!